Learnin’ Here, Learnin’ There, Learnin’ Soom Good Woons Everywhere – Run. Ride. Roam. 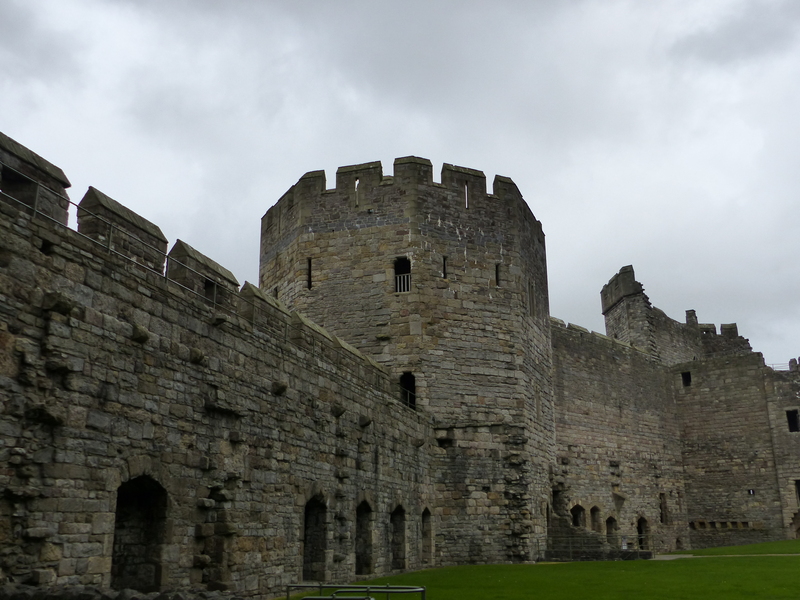 Our stop for the night was Caernarfon, so our plan for today was to do some exploring here, starting with the castle. We headed out for the walk through the streets of this nice little town and once again, I opened my ears to the locals. “Mornin’. How are ye?” asked a man cleaning the front window of his shop, as another man approached. “Fain. Cawld,” came the reply, as he gestured how chilly it was. It was blowing mighty wildly today, so much in fact, that I was half jogging down the street, just from the wind pushing me in the back. “We don’t like wind,” commented Steve, after picking up his cap that had detached itself from his head and was spinning and rolling away in that wind that had no manners. “We can handle rain and a breeze, but wind like this…we don’t like that.” I could do nothing but agree with him! I even had to hold my beanie on my head, the wind was so strong it was threatening to take a hold of that too! 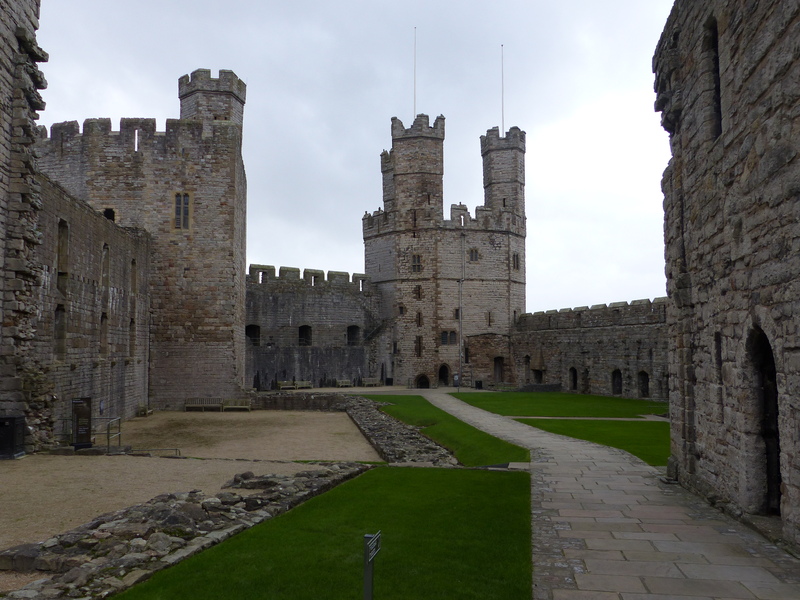 When we arrived for our exploration of Caernarfon Castle, it was to find we had the whole place to ourselves, being the first ones through the door. 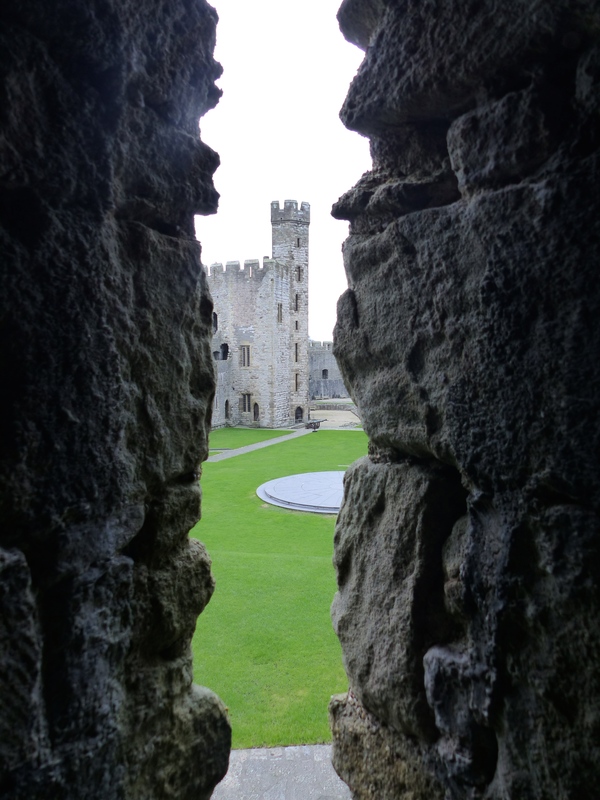 The castle was amazing and we wandered around the grounds, narrow passageways, steep winding staircases and ramparts, with no one around but us and the castle walls. Steve decided the “hand in pocket” was his regal pose for today! I’m not regal, I’m just scruffy and windblown…the court jester! History Alert! After walking around the castle, we spent some time in the Museum of the Welch Fusiliers, which was also housed there. I learnt some interesting historical tid-bits, which I’ll share. So if any reader is not in the mood for some historical trivia, you may skip this bit! > The challenge of “what to pack, how much to pack and will I really need it” which every traveller faces, was probably experienced by the Fusiliers too. I wondered about the necessity of some items in the pack of Sergeant Peter Hewitt, in 1745. In his knapsack he carried; 2 shirts, 2 stocks and a pair of stockings, 1 pair of summer breeches and shoes, a clothes brush, shoe brushes and black ball (polish),1 handkerchief, 2 combs and knife and spoon. He also carried provisions for six days, as well as a blanket and a canteen of water and a few personal possessions. Along with his weapons and uniform, he carried 45lbs (20kg). When I saw that list, I thought, Mate I reckon you could have done without some of that. Do you really need two combs? I’d ditch a comb and add a fork to go with the knife and spoon! And shoe brushes, really, do you need shoe brushes and a clothes brush? I know appearances are important, but I’d be asking a commanding officer if all those brushes were critical pieces of kit! > Sieges were major operations and the most common activity of war in the 18th century. To provide the soldiers with all the equipment and provisions needed, a siege train was an essential part of the operations. This required a huge number of horses, to haul all the equipment. On one occasion, 16,000 horses were used. I found that number staggering, to need 16,000 horses to carry equipment. The poor horses. > The Welsh language has always been important to the Regiments and it was actually used to confuse the enemy in Burma in 1944 and in Bosnia in 1995. > Mother Ross was an interesting figure. Her first husband left her, when he went off to do his soldiering, so she dressed as a man and joined the army herself. She was wounded at Ramillies in 1706 and discovered to be a woman. She then “remarried” her first husband. He was killed in 1709, so she married another soldier, who was also killed, so then she moved on and married Private Davies, a Welch Fusilier. See, a wife needed another army husband to keep her full supply of rations! She was eventually given an army pension for her service (and what service it was!) and Mother Ross was buried with full military honours in the Royal Military Hospital, Chelsea. > Jenny Jones was another amazing woman. Mr Jones joined the army in 1815 and Jenny went with him, as washerwoman and nurse. He fought at the Battle of Waterloo and was wounded. Jenny lay by him for three days on the battlefield, nursing him and his wounds. Both returned to North Wales. She outlived him, to die at the age of 90. > The Fusiliers have a goat. He is male and not a mascot, but a member of the Regiment. He is cared for by a junior NCO, who is known as the “Goat Major”. It’s not known when a goat first served, but records show one being in Boston in 1775 when the Fusiliers fought in the War of American Independence. 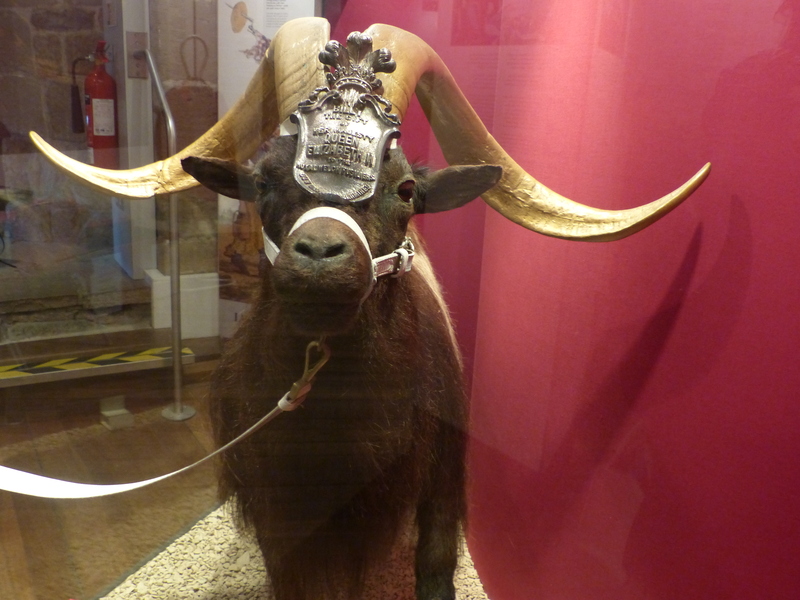 In 1777, a historian wrote, “The royal Regiment of Welch Fusiliers has a priveligious honour of passing in review preceded by a goat with gilded horns…the corps values itself much on the ancientness of the custom.” (I personally liked the use of the word ‘priveligious there! I’ll try and find a way to slip that one into future conversations!). In 1844 Queen Victoria presented the Regiment with a white goat from the royal herd and the Regimental Goat is still supplied from the royal herd today. I’m not sure how the goat felt about its involvement, since it was conscripted, rather than being a volunteer like all the other members of the Regiment. The poor ol’ goat didn’t get much choice in the matter. > A piece of uniform that’s unique to the Welch Fusiliers, is the “Flash”. During the 18th century soldiers wore their hair long. Their pigtails were greased and sometimes covered in flour, to match the white tail of their wigs. The white, floured pigtail would mark their scarlet coats, so it was tied at the back of the head, with a black ribbon. In 1808, for practical reasons, the pigtail was abolished and the men had to cut them all off (to much cursing, muttering and general disagreement from their wives apparently! ), but they decided to keep the black ribbons, in which their pigtails had been tied, as part of their uniform. From the slang name for the wigs they wore, this became known as a ‘Flash’. 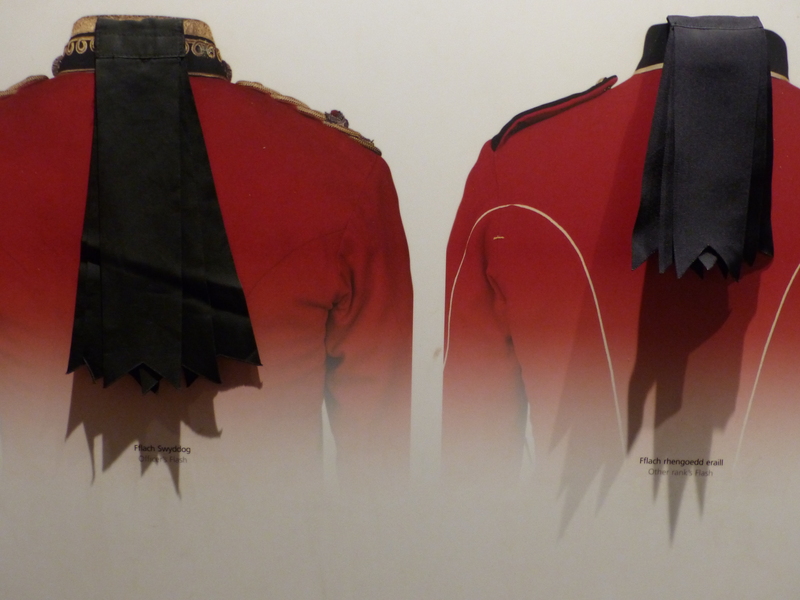 It was originally only worn by Officers, but in 1900 Queen Victoria approved it for all ranks and it’s still worn proudly on the uniforms today. > I hadn’t realised that Siegfried Sassoon was a Welch Fusilier. He fought at the Battle of the Somme and other battles of WWI and was awarded the Military Cross. Of course, he most famously wrote poetry as a form of protest against the war. 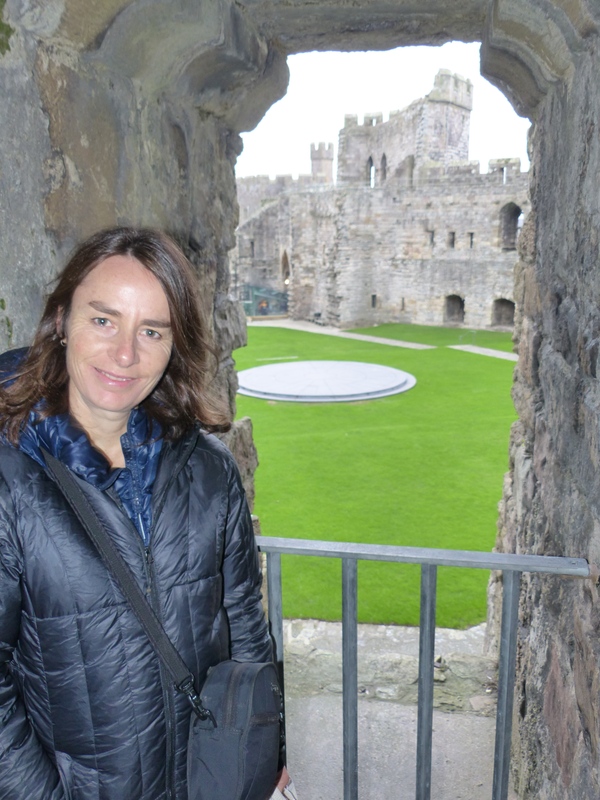 It was a fascinating place to visit. 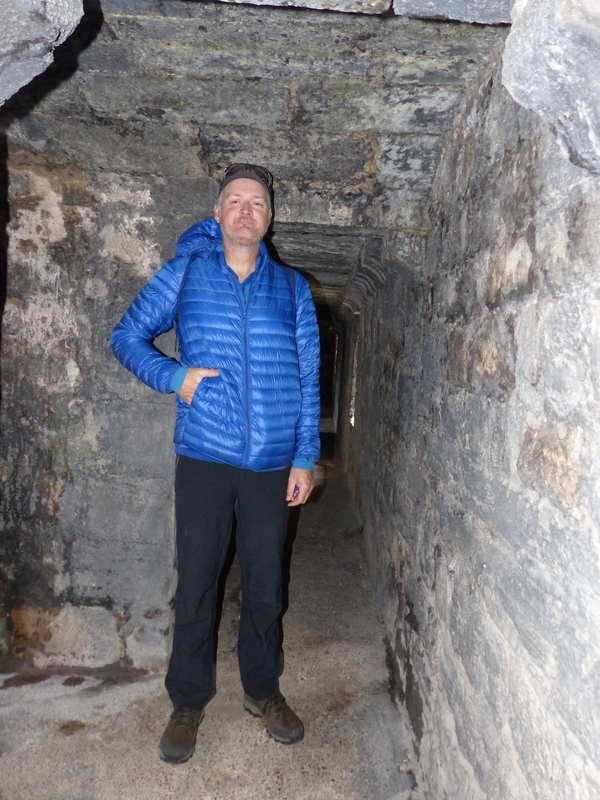 The castle was an amazing place to explore, roaming through the narrow passages and climbing the steep, spiral staircases to the turrets, then to spend time reading and learning the history of the Welch Fusiliers at the Museum. It was a fantastic and really interesting few hours. 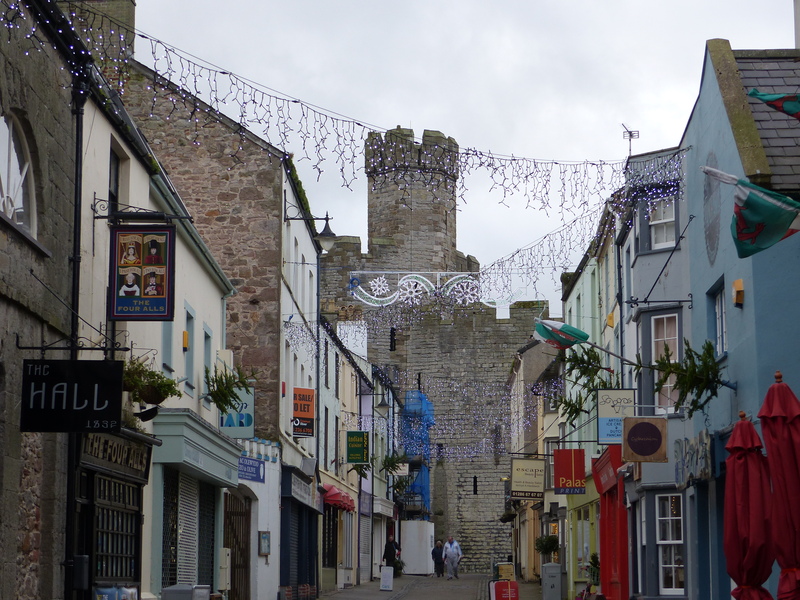 We eventually left the grandeur of castle life and went for a stroll around the town to take in some local life. 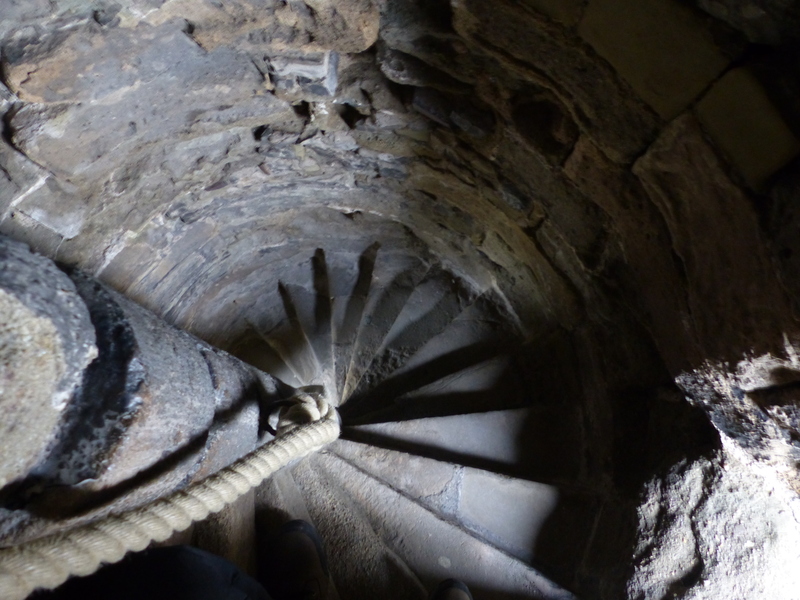 Definitely staircases where small feet are an advantage! 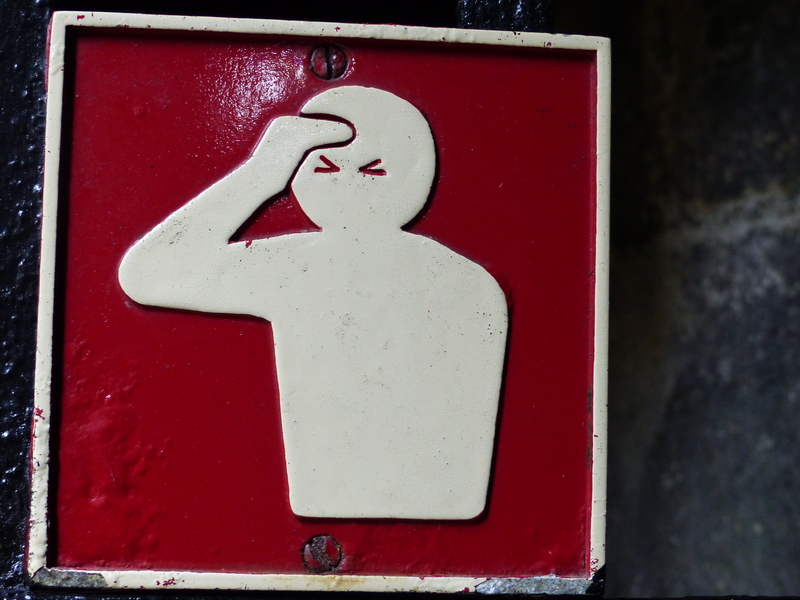 I think this warning sign was modelled on Steve. He knocks his head a lot! The language we hear predominantly on the street, is Welsh, so I’ve been having a go at using another language. 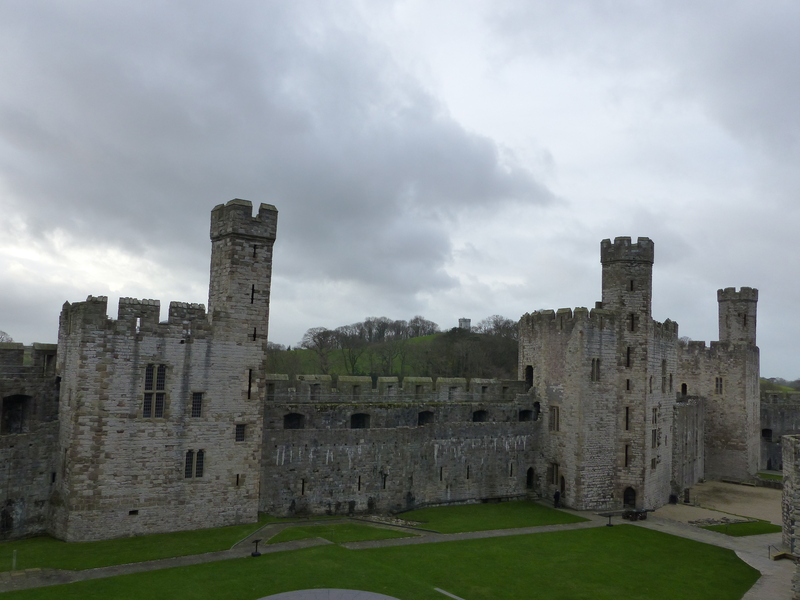 When we left the castle, I turned to the man at the front desk and said, “Thank you very much,” then corrected myself and said, “Diolch yn fawr iawn.” He smiled broadly and replied, “Croeso,” (you’re welcome) and it was another reminder of how much locals appreciate us giving the language a go. Even if we don’t get it perfect, the effort is appreciated. When our roaming was done, we found a laundrette, to get some washing done and met some diamonds of ladies, who showed us how to use the machine, then offered to put our load in the drier for us, so we didn’t have to go back and do it. As we were leaving, I thought I’d give it a go again. “Soom bard woons moor laik,” laughed a young fella who was with them. A golden rule of travelling – always give the local language a go, it’s worth it for the response! As it turned out, the lady who would “teach me soom good woons” wasn’t there when we went to collect the washing, but I had a very nice chat to another lady about all sorts of things, the town, our travels, the devastating floods in Cumbria, Christmas…lots of this and that and it was a lovely chat. Well, I may not have “learnt soom good woons”, as far as words and phrases go from the gem of a laundry lady, but I sure learnt soom good woons, about history, soom facts and stories, soom language, and the best learning all…discovering how friendly the people are in yet another town we’ve visited. The tally of friendly folk just keeps rising. They’re the good woons! The people are most definitely the good woons! On we go tomorrow, heading a little further North, before making our way East. We’re not too sure where we’ll end up tomorrow – another day with a surprise destination! 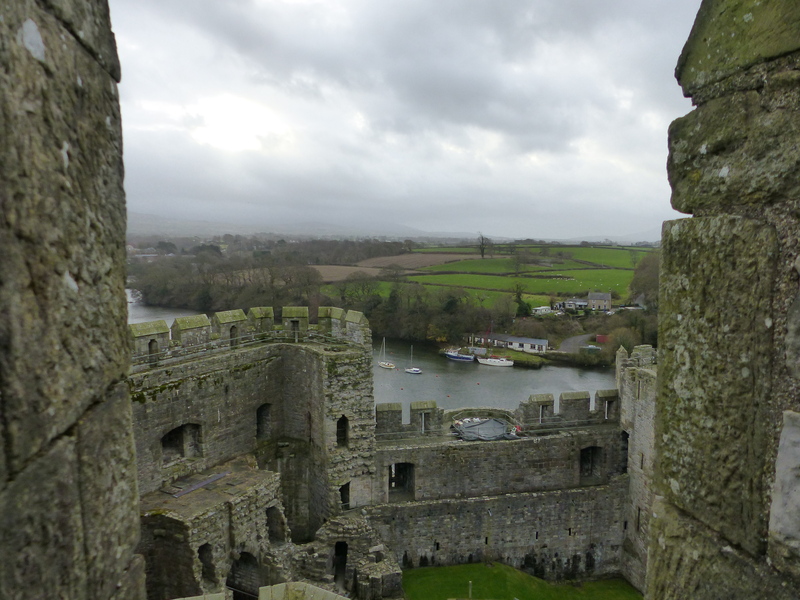 We could be still in Wales, or we might have crossed the border back into England, we just don’t know yet. Wherever it is though, it will be just grand. Simply splendid. Perfectly smashing! Move Over Tom Jones, There’s A New Welsh Warbler In Town And He’s Tasmanian!